We will be doing our best to keep the site up and running as it was in the past. Please allow us a day or two to respond to emails as we hire new staff and get organized. If your trip is in the next 7 days please put Urgent in the subject line. It is with great sorrow, I must inform you that Bubba has passed away. Born July 14th 1965, Jerry “Bubba” Hallstrom died from a heart attack yesterday, Wednesday November 17th 2010. This has come as a bitter shock to his family and friends around the world. I have only known Bubba for a few short years of countless fishing trips and the work we did together on this website. However with Bubba, it didn’t take much time for one to find his genuine, caring, & gentle personality. Bubba had a burning passion for fishing, and an even stronger drive to share his love of the sport with whomever he encountered. His spirit lives on in our hearts & memories. Please keep Jerry’s family in your prayers. Condolences sent via email will be forwarded. Bubba has left behind many dogs and cats that he rescued during his time in Costa Rica. These animals would all make wonderful pets if you are interested in adoption. If you have an upcoming trip booked that you have already made a deposit on please contact us to re-confirm it. Please use the following email address for all correspondence : help@costaricafishingreport.com . The internet in my neighborhood has been down for 3 days so I apologize for any delays in emails and fishing reports. I can read emails on my blackberry but my finger are too fat and my eyes to old to be using those small keypads. The boats that went out the last few days said things slowed a little but they all talked about water temp and how it could be a big marlin year in Los Suenos. Last year our water temps were 85 to almost 90 degrees at sometimes in some spots. The water temp right now is less than 80 degrees. The marlin and tuna like it a little cooler than the sailfish and mahi mahi. My neighbor in the 36′ express caught another marlin and a sailfish the other day making it marlin 3 days in a row. Now I have seen everything. In Jaco they now have guys in green shirts out at the street corners selling tours including fishing trips…guys that have never been fishing, guys that know nothing about fishing and they are selling the crappiest boat in the bay. Make sure if you book a boat you book it from someone who knows about fishing. Even if the guy knows something about fishing do your research. I had a guy send me an email today and he decided to fish with someone else just because they had a smaller boat for $100 less than my 28′ center console. The guy he booked with was caught last year stealing tips from the mates and captains. He would go fishing with his clients…collect the money for payment and tip and then slip part of the tip money in his own pocket. We had 2 American guys that call themselves agents get caught stealing tips last year and they were blackballed from some boats and their name is mud on the charter dock…but they are still out there trying to sell charters. I have been trying plan a trip to Puerto Rico to go fishing and I am starting to not trust some of those “vacation adviser” sites on the net. There was a thing on TV about lots of fake comments being posted at one of the most popular sites. I checked some of the hotels around here and there is an American owned all inclusive an hour away from Jaco Beach. It is on a terrible beach in a dangerous town with no tourist activities near by and it still had dozens of comments about how great it was… a little fishy. The weather is getting better..today was beautiful until about 4 pm and then it rained hard for a few hours. My neighbor that runs the 36′ express in Los Suenos had back to back grand slams. Today he caught 4 for 7 sails, a blue and a striped marlin and a big dorado. The 33′ express caught 4 sails today. The 32′ custom caught a striped marlin and a blue marlin. Things change fast offshore. My neighbor that runs the 36′ express went offshore today and caught a few sailfish, a striped marlin and a blue marlin. That’s called a grand slam and is a feather in any captains hat. Last I heard he was at the bar teling fish stories. Thanks to all the men and women that have served our country. We may not always support going to war but we should always support the people that have fought to keep us free. The ocean is a big place and can change fast. Earlier this week the bite was good…everyone was catching lots of mahi mahi and the boats that pushed further offshore were catching sailfish and some marlin. Today is was the exact opposite…everyone struggled offshore. I heard a couple boats even got skunked. The guys on the 28′ center console went out today and caught a 30 pound tuna and a nice bull mahi mahi in the 40 pound range. The slow fishing is what we should have had right after the heavy rains last week. It should pick back up over the next week. The fishing on the central Pacific coast has been very good considering the bad weather we had last week. The guys on the 42′ custom in Los Suenos fished offshore and went 6 for 9 on marlin and added 2 big mahi mahi. The 28′ center console in Quepos fished 2 days and caught a marlin, 3 sails and a dozen yellowfin tuna. The 36′ flybridge in Quepos went offshore and caught some sailfish and a half dozen mahi mahi. It’s been sunny for several days and no rain to speak of…summertime is almost here. Everything is starting to get back to normal along the Pacific coast after getting rocked with heavy rains all last week. Usually heavy rains make the ocean brown and can slow the bite but I guess that’s not the case. I heard from the captain of the 36′ express that there were lots of mahi mahi 20 to 25 miles out and some marlin biting 35 to 40 miles out. The guys on the 33′ express went offshore yesterday and found a nice trash line about 20 miles out…they caught a handful of mahi in the 35 to 45 pound range. Then left the mahi and went out to by the craters and even though the water was green they caught 2 sails and another nice mahi mahi. The bite is good now and that’s a good sign…because it should only get better from here on out. 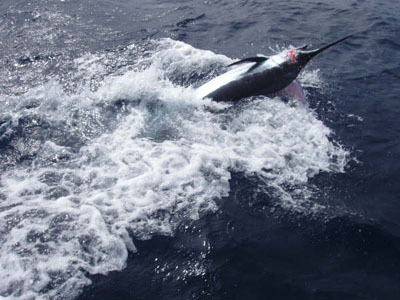 You are currently browsing the Costa Rica Fishing Reports blog archives for November, 2010.